The Filson Journeyman is one of the first watches to emerge from the partnership between luxury goods maker and Detroit watchmaker Shinola. Powered by Shinola’s Argonite movement, and has a stainless steel 44mm case with matte brass PVD plating and anti-fingerprint coating. The scratch-resistant sapphire crystal has an anti-reflective coating for glare reduction. 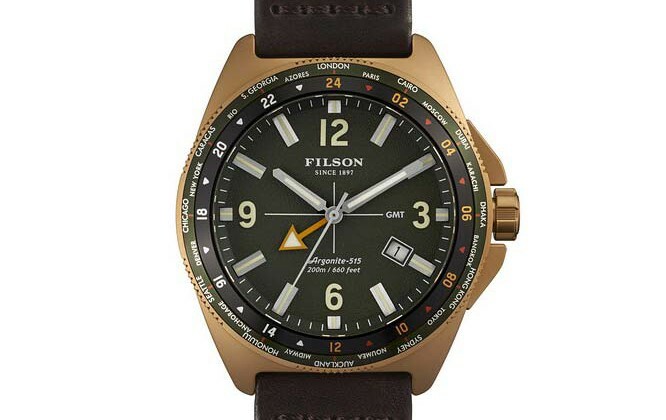 Additional Filson Journeyman watch features include a rotating top-ring World Timer function, USA-made Bridle Leather strap and a green dial with Swiss Super-LumiNova hands, numbers and index to maximize readability. Estimated pre-sale shipment date is March 5th, 2015. Filson Journeyman Watch : Filson Watches by Shinola 0 out of 5 based on 0 ratings. 0 user reviews.